Windows 10 is a great OS. The curated list of software you must have on your computer. Most of the software doesn't need any introduction. The download links are original authors websites. Bookmark this page to keep the list handy. All the software included are completely free. Windows Defender is really getting better. Spybot - search and destroy is also best free anti-spyware, anti-malware and adware cleaning. Malwarebytes is proven security program. Even though you don't buy a full version, its best to deep scan your system if you are suspicious about anything. It works as perfect backup plan. The trial version is fully active without any limit on features. It runs on demand (free version) and does not conflict with your native or third-party Antivirus program. And its great at finding threats. Sandboxie is a special tool. If you try too many stranger software, you need it. It runs the new software completely isolated from your windows system. You can be safe from potential threats of unknown software. Google input tools: If you want to write in any language other, this tool from google may help you. Supports about 22 languages all over the world. MP3 Tag: a Free solution to edit everything about your MP3 collection. You can edit all tags, album art. Compare with the online open database. Bulk editor and tagger. An open source SVG graphics editor is Inkscape Download. A basic Corel Draw competitor. Wireless Network Watcher allows you to list and track every device connected to your wireless router. Simple and practical tool. Wireshark is a free and open source tool to monitor in-depth your network activity. Evey pocket of data sent and received. Find the 12 best tools to create the bootable USB drive. Solid PDF and PDFZilla for converting from PDF to word Download. Not free but 15 days trial is free. You can Google it for download. Recuva helps you to recover deleted files. Undelete is also find luck. WinDirStat presents you a graphical data about the disc usage so that you can easily find and delete large sized unnecessary files. TreeSize Free is also a disk usage monitoring tool to find junk files and delete them. Notepad ++ : A developers replacement for Windows Notepad, is useful for everyone else. Evernote: If you don't use Evernote note-taking app, you are really missing something great you are unaware of. Download Evernote and try it. Open Hardware Monitor gives you the temperature, speed and much other information about your hardware performance. 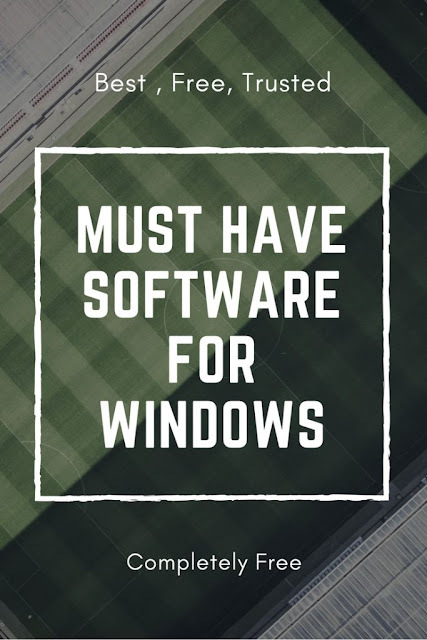 You can Download all these software from their homepages or Visit Ninite or FreeNew to get all these software in on single installer. I will keep this List updating and also make some changes to download links. Please add your suggestion in the comments. Hi there, I do believe your website might be having browser compatibility issues. Yes. Thanks for the information. I am already trying to fix it. You can use IE 8 and 9. these versions render the pages fine. Only IE 6 and 7 have the problem of overllaping. I was soooo excited when I thought I had found my answer to converting pdfs to text...link is gone :( Any help for a loyal reader and hard working copywriter???? this is a great an free tool for all your PDF needs. You can easily convert any file to PDF and any PDF to text file, easily view PDF, Merge and Split PDF files. It is also useful to convert OCR text from scanned image. Dear Kimberly, You can use Solid PDF is 15 day full feature trial version. You can use that.